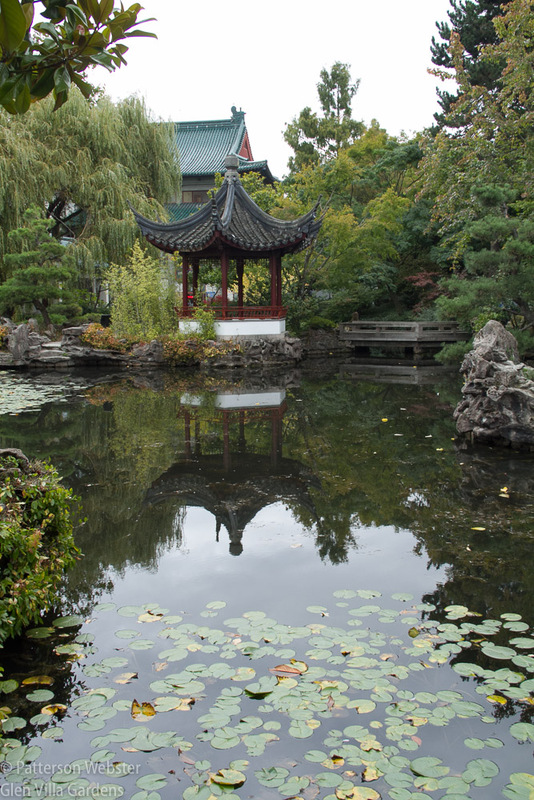 Vancouver’s Dr. Sun Yat-Sen Classical Chinese Garden is an oasis in the middle of a busy city, a place to rest and reflect on a garden tradition that reached its peak in the Ming dynasty (1358-1644). In accord with the Taoist philosophy of yin and yang that guides the garden’s design, the aim is to balance opposing forces and thereby to achieve the equilibrium that constitutes perfection. Behind the walls that separate the garden from the city, contrasts of dark and light, flexible and immovable, rough and smooth, large and small combine to create a picture of harmony that pleases the eye and soothes the soul. 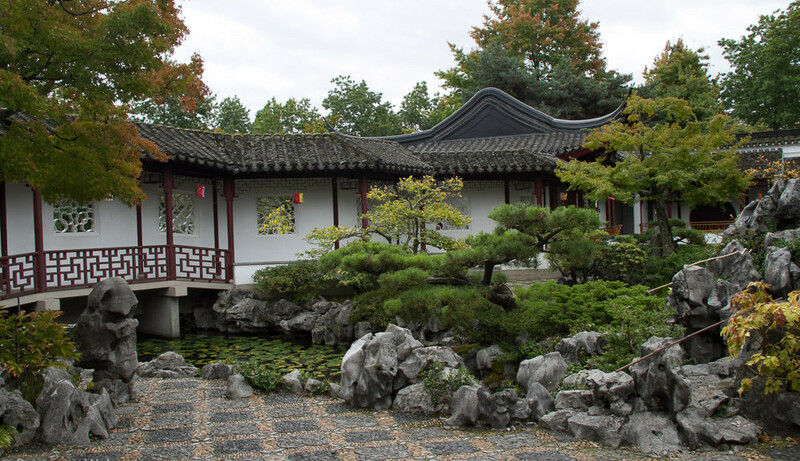 The first courtyard at the Dr. Sun Yat Sen Classical Chinese garden shows many yin and yang contrasts — black roof tiles and white walls, rugged rocks and soft foliage. 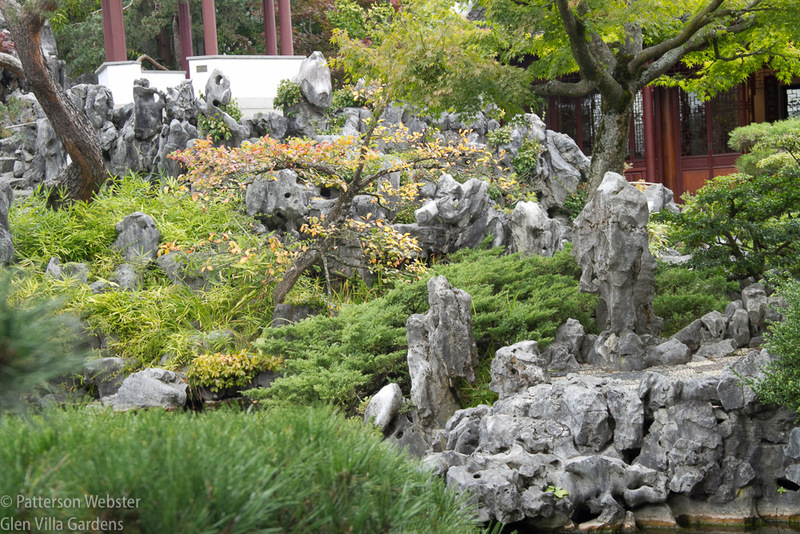 In this type of classical Chinese garden, rocks and plants are arranged asymmetrically, emulating the rhythms of nature. Winding paths and corridors present different viewpoints, some full of energy and movement, others calm and reflective. 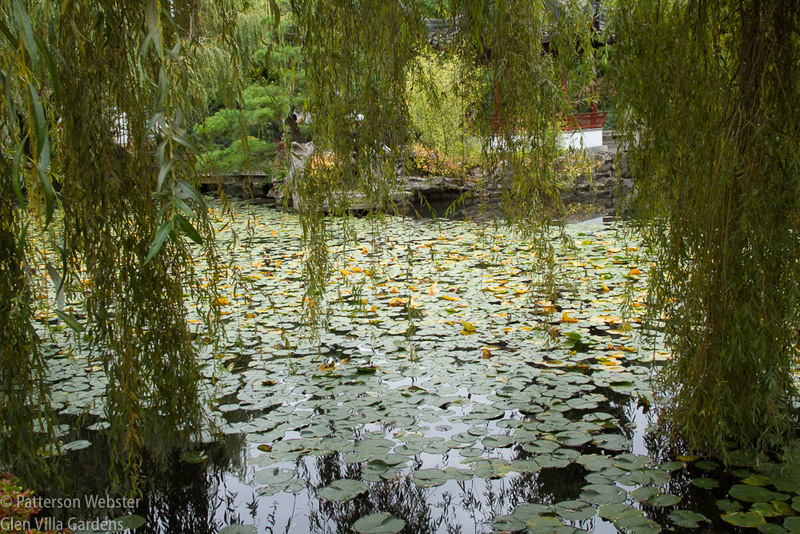 Water lilies cover the surface of the water, screened here by branches of a weeping willow. Rocks are a major component of the garden. The most striking are the limestone rocks imported from Lake Tai near Suzhou. These weathered, water-worn rocks full of holes and crevices bring a rough beauty to the garden which is particularly evident in contrast to the softness of pine needles and foliage touched with autumn. 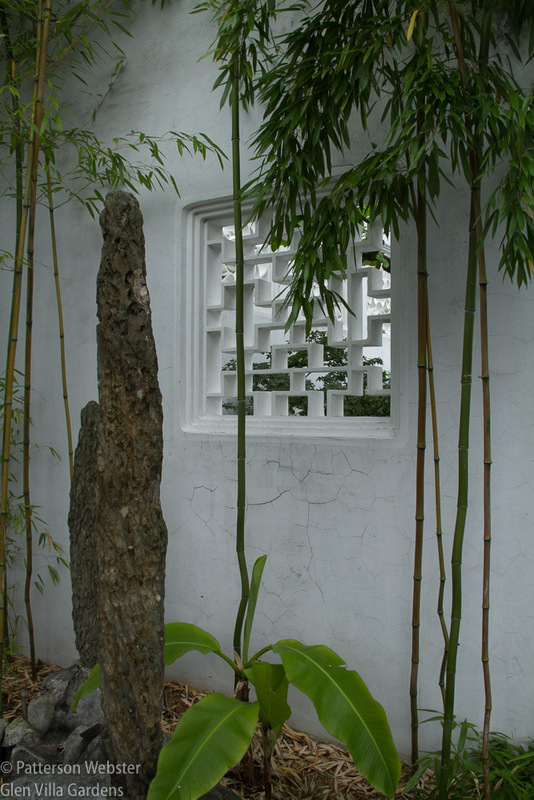 Tai rocks are essential elements in a Ming dynasty garden. The holes and crevices are caused by the high acidic content of the lake water where they are found. This yin and yang contrast is built into the very structure of the garden — there is a male side composed of hard straight lines and a female side with soft curves. The use of opposites is seen also in the choice of plants, the use of water and stone, even in a double corridor where one side is sunny when the other is in shade. Patterns in the stone paving used throughout the garden underline not only the opposing forces but also the search for balance and harmony between them. 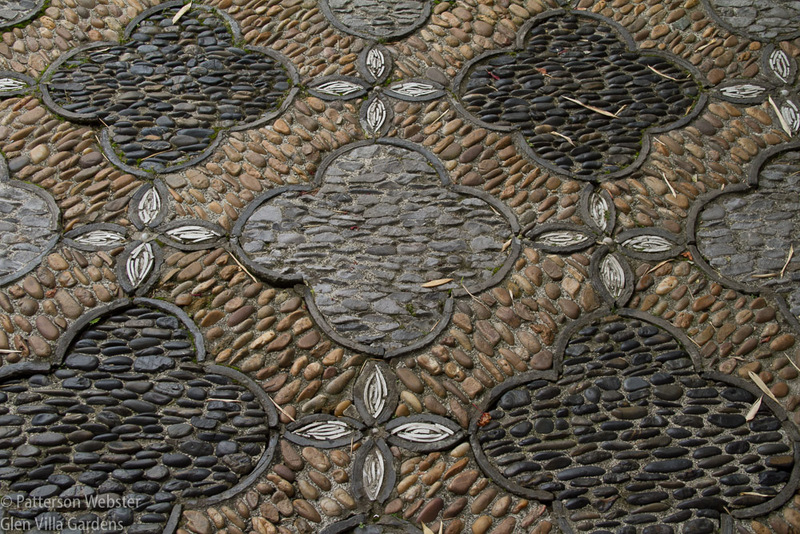 The paving in the female half of the garden uses stones of different colours and different textures, arranged in different directions, to create a beautiful flower design. I was particularly struck by how subtly the different pavement patterns illustrate the principle. 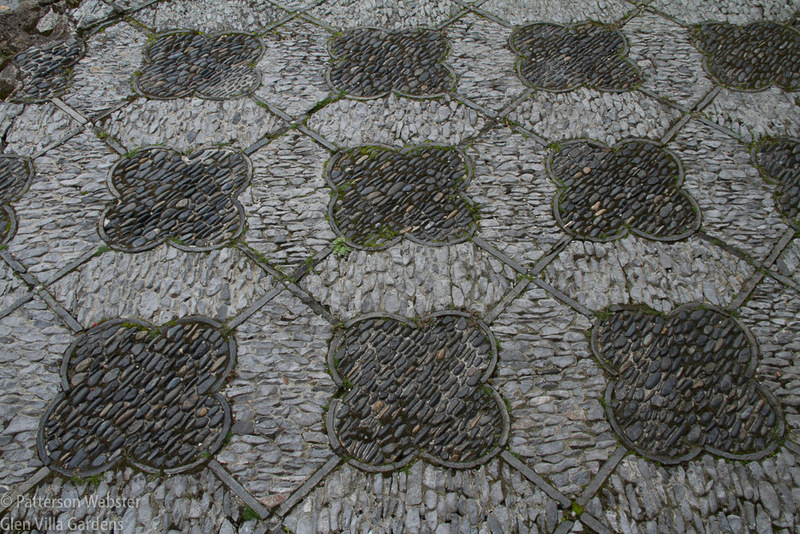 This pavement pattern in the male part of the garden is composed of straight lines, thought to be representative of male characteristics. Black and white are the most obvious contrasts but rough and smooth textures also feature, as do changes in direction and the size of the stones. 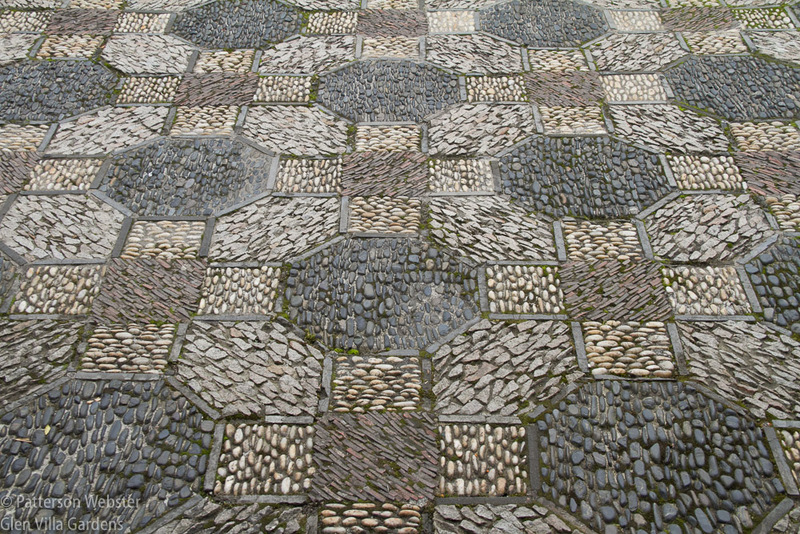 Black and white are highlighted in this paving pattern. But note as well that the stones are laid in three different directions. Harmony and balance are the aim, for the garden is meant to be a resting place for both body and soul. The weathered Tai Hu rocks form the skeleton of the garden, water forms its lifeblood, a soft yin balancing the rocks’ hard yang. The cloudy, jade green colour of the water is intentional. Created by clay that lines the bottom of the pond, the cloudiness symbolizes tranquillity and enhances the reflective quality of the water, doubling the pleasure brought by the view. Plants set the mood of the garden, evoking a landscape that was the ideal for the Ming dynasty scholar whose garden this is meant to replicate. 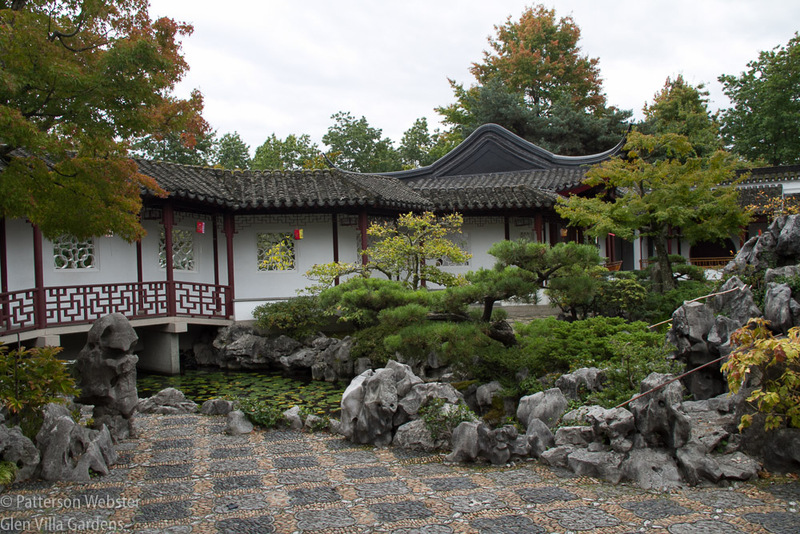 The three friends of winter — pine, bamboo and winter-flowering plum — are planted outside his study, symbolizing the human virtues of strength over time, resilience combined with flexibility and continuity and rebirth. Outside the scholar’s bedroom window a banana plant acts like a weather bulletin: if is raining, the scholar hears drops falling onto its broad, flat leaves and dresses accordingly. The rugged Tai rock and bamboo combined with the straight lines of the ‘leak’ window indicate that this is male territory. Throughout the garden individually patterned ‘leak’ windows as shown in the photo above allow air, light and views to leak through from one part of the garden to another. Words play a part in this garden as well, making explicit what otherwise might be hidden. Calligraphy was, and is, an art form in China, and the beauty of a person’s calligraphy was an indication of status and education. 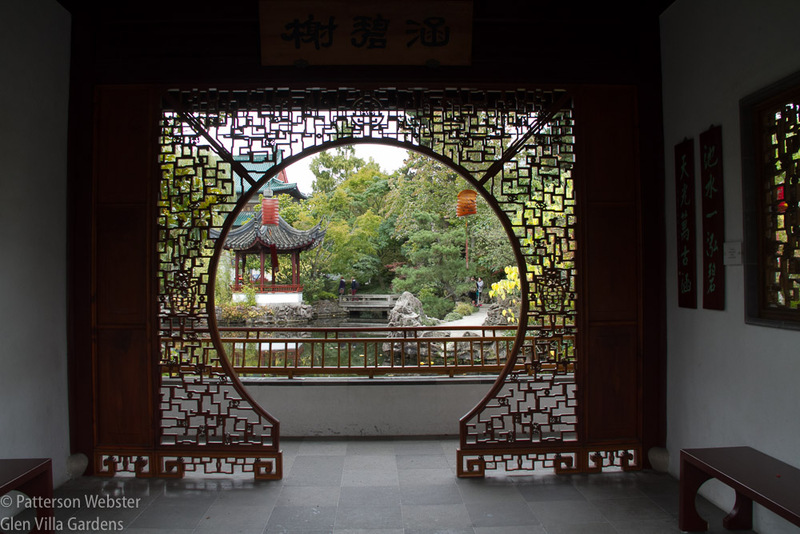 A Ming scholar’s garden would always include words appropriate to the setting, and the Dr. Sun Yat Sen Garden is no exception. Fretwork panels are carved from ginkgo, a soft wood favoured by carvers. The calligraphic panels are on the right-hand wall. Clearly the words are meant to evoke a response to the light on the water nearby, and to the vision of the pavilion and its reflected double. The setting enlarges the context, taking it from the particular to the universal. For here, the moon gate presents a never-ending circle, heaven and perfection, while the square opening that surrounds it symbolizes the earth. Together, balanced, they are yin and yang made visible. The idea of balance, searching to follow the central Way, avoiding the extremes of left and right, male and female: these are ideas that appeal to me personally. Yet finding the balance, particularly between illusion and reality, was a challenge for me as I walked through this very special garden. It was beautiful, without question, and I enjoyed being there enormously. Our knowledgeable guide enriched the experience with information that helped me understand more thoroughly all I was seeing. But a garden that aims to find the balance between energy and calm needs to be experienced in both ways. I need to return to the garden, to sit and soak in the sunshine, to appreciate the contrast between the quiet sounds of nature and the raucous cries of children playing outside the walls. I need time to reflect on the ideas behind the garden and how they relate to the reality beyond. While in many ways the garden feels timeless, it is actually quite new, built only thirty years old in 1985-1986. And while I felt calm, isolated from the noise and aggression of the city while I was inside the garden’s walls, the city was there all the time, peering over the walls, inescapable. I had to chuckle at the sign that appeared just above the garden wall. Surely it should have said East, not West. The Dr. Sun Yat-Sen Classical Chinese Gardens bills itself as “Refreshment for the Heart.” It prides itself on being the first classical garden constructed outside China, built through a cooperative arrangement between Canada, the People’s Republic of China and Vancouver’s Chinese and non-Chinese communities. That collaboration is admirable, as is the garden’s location next to a public park. 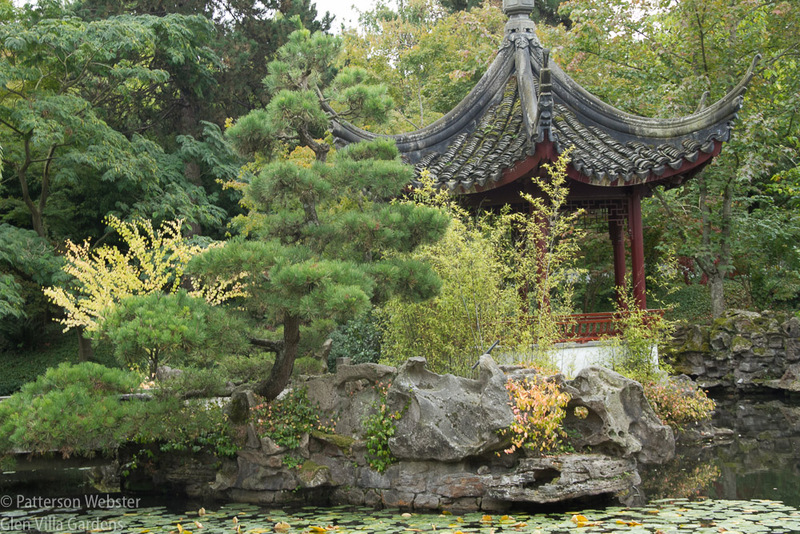 Strong pines and graceful willows frame a curved-roof pavilion visible from the private garden but accessible only from the public park. Yet I couldn’t help comparing the reality around me with the reality I experienced when I lived in China during the Cultural Revolution, from 1969-1971. The country I lived in then bore no resemblance to the idealized landscape that was around me. I was a different person, with different priorities and different needs. Illusion, it seems, is at the heart of the garden. Reality is outside the walls. Who was Dr. Sun Yat Sen? Sun Yat-sen (1866 – 12 March 1925) was a Chinese revolutionary, first president and founding father of the Republic of China. He was a doctor and played an instrumental role in the overthrow of the Qing dynasty. Appointed as Provisional President of the Republic of China when it was founded in 1912, he was a uniting figure in post-Imperial China and remains unique among 20th-century Chinese politicians, widely revered among people from both sides of the Taiwan Strait and the political divide. 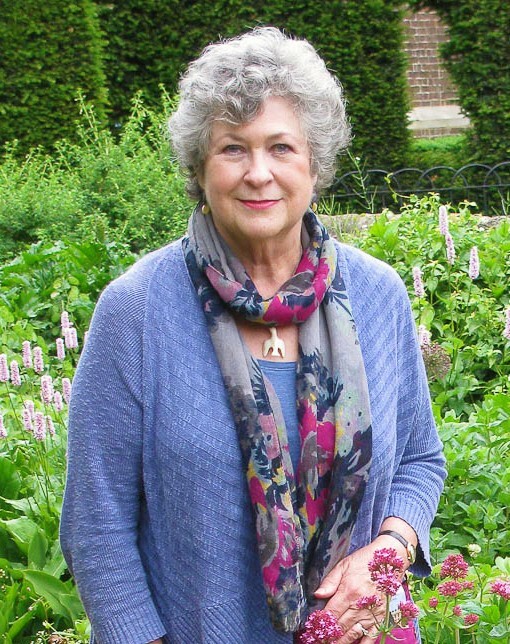 I have always been intrigued by these gardens! They are worth multiple visits. There’s a big question in there, perhaps, about how and why one thing becomes another? There are lots of big questions for me, not as much about this garden as about it caused me to consider. One thing is the role of historic gardens and how they are to be maintained, modified or continued; another is about historic re-creations. 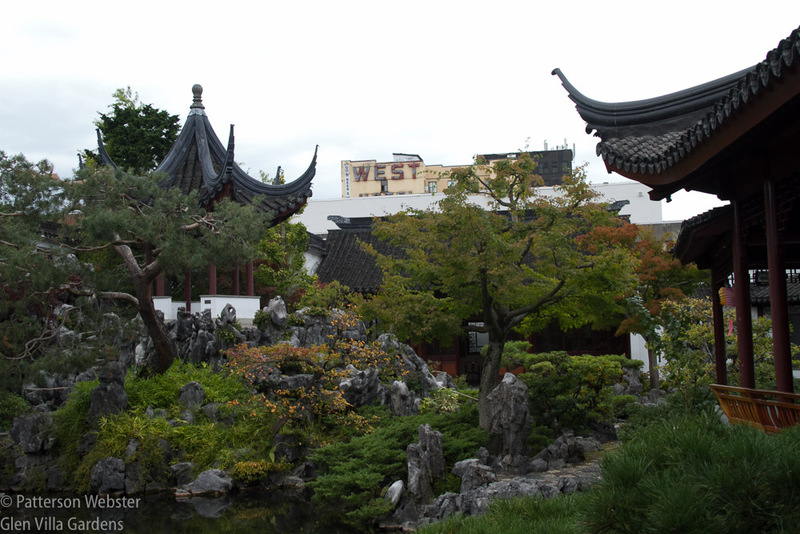 The Sun Yat-Sen garden is in the heart of Vancouver’s Chinatown; this area and its inhabitants have significant historic roots and today’s Chinese community plays an increasingly important role. People who live nearby clearly enjoy the quiet space of the adjacent public park, as would I if I lived there. I’d like to see a contemporary version of the yin yang idea, as well — if well done, it would enrich the whole experience enormously. But for me, the biggest challenge was to get my head around the reality/illusion dichotomy. I’m still working on that. It is such an amazing garden. Your description & photos of the stone pavings are fascinating. Thank you, Linda. I’d very much like to go back and soak up the atmosphere. Too bad we didn’t know about this garden when we visited Vancouver years ago. I really enjoyed your discussion of the elements of contrast and harmony found in this garden. Your closing on the contrast between the cultural ideals reflected in this garden and the reality of Chinese political history is well taken – but don’t we find the same kind of contradictions in the culture and history of almost every nation? No, I’m not sure we find the same kind of contradictions in the culture and history of other nations, or at least not when the ideals of the garden are set against the realities of a truly repressive regime. I’d love to discuss this idea, though, because there is a lot more to be said. Maybe at the Fling in Washington — and could there be a more appropriate time and place to discuss the topic?